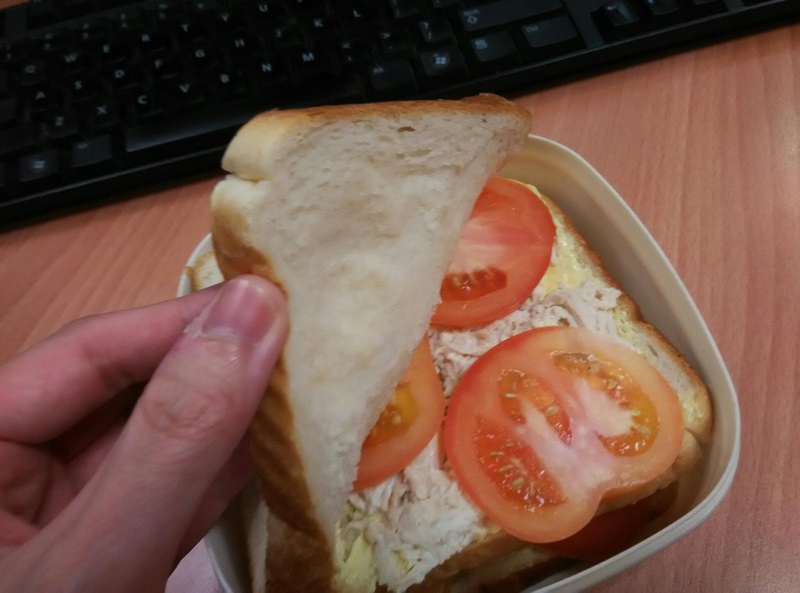 Today, I had homemade chicken mayo sandwich for breakfast. The chicken was from my mum, she used them to boil soup for dinner yesterday. We went to my parents' house for dinner yesterday and mum boiled winter melon chicken+feet soup (with a chicken carcass and two big chicken breasts). "I've packed the chicken (breast) meat for you in a bag. Please take it home and make chicken mayo, I know you like chicken mayo. If you don't take it, dad will feed them to the neighbour's dogs". Aiyorrrrr!!!! So nice to be your dad's neighbour's dogs! Hehehehehe!!!! Ya lor, mum says everytime she boils soup (using chicken carcass or chicken meat), dad will feed them to the dogs.. Not our dog (ours a poodle, very old already, 90 yrs old), so he fed them to our neighbour's dogs, 4 of them! BTW, just two sandwiches there?? mana ada cukup for you?? i thot you can eat 10!!! 4 slices of bread, cukup for breakfast la.. If for lunch & dinner, yes, 12 slices of bread pun boleh! Eh, but hor, chicken breast very kasar one the texture, KFC chicken I must have chicken thigh, and yes, that one, I can eat 15 pcs original! Oh chicken mayo - I see you stack up very high leh. Simple and makes your tummy full. I like chicken mayo sandwich. It's quite a good idea, cook soup already and the the chicken meat can use for sandwich. But for me, usually I boh sukak the breast. Yup same here. I boh sukak breast meat, but since it would be shredded and mixed with mayo, ok la, can la.. But if kfc or ayam goreng nasi kandar, I must have thigh.. Your mum said if you don't want, your dad would take and feed the dog, cute la! Anyway, sound so good to mix with mayo and that is all you wanted for your splendid breakfast. Ya lor, dunno whether to laugh or cry when mum says dad will feed the dogs if I don't take it.. I always liked chicken sandwiches and didn;t know it is actually quite easy to make. You know lah, Anay just eat & eat only. Poodles are very intelligent dogs who can understand humans talk. Agree? Yup, dogs are very smart one.. They smell you cooking, especially chicken soup or chicken liver, they will stick to you like glue.. But too bad, I took all his chicken meat, so, no food for the dogs already (including the neighbour's dogs)..
Muahahahaha! You are a funny mama! I'm also very lazy, but since I can pre-make this and put in fridge, then next morning can just spread on bread..
Yeah, easy meal, can pre-make the day/nite before..
Good that your mum asked you to tapau the meat. Yum yum. I like this kind of simple sandwich. Haha, yes, she says if I don't take, the dogs will get it LOL.. I like to eat chicken breast meat. Even when used to boil soup, I will eat the chicken meat just like that with the soup. I very geli to eat smooth and slippery chicken meat like chicken thigh meat. If don't like chicken breast meat, it is a very good idea like what you have done, not to waste them by making mayo pepper chicken sandwich. 4 slices of bread are good enough for breakfast to last you until lunch. Good for you! Thanks for posting. Miss your posts. I don't always eat breast meat, but because my mum gave, I just took it lor.. She said if I don't take, the dogs will get it LOL..
Add butter and raw tomato slices to the sandwiches makes them so tasty! I like! Ya, that's the easiest.. Slice tomatoes kautim liao..
Wei, you get chicken, nei zhong siong dim jek?? If my mom... "I pack all these veggies for you so that you cannot buy any meat. Make sure you finish them first!" Haha, yeah.. Not only chicken.. If got leftover food, she will pack for me to take home also la.. I like all kids of sandwiches too.. I don't like veggies and greens, but if put in a sandwich, I'll eat, weird hor, haha.. I want!!!! looks yummy and perfect for breakfast! You can always make it.. Boil soup with chicken, take the chicken and mix with pepper and mayo only.. Best eat chilled, sedap !! Sandwich is just simply easy to make and yummy! Slim finger ahh? Angle only, haha..
Chicken breast is very dry, but once I mixed with mayo, taste good.. Best eaten chilled, sedap..
Yup, easy also.. Boil chicken soup, then take chicken and mix with mayo.. No waste..